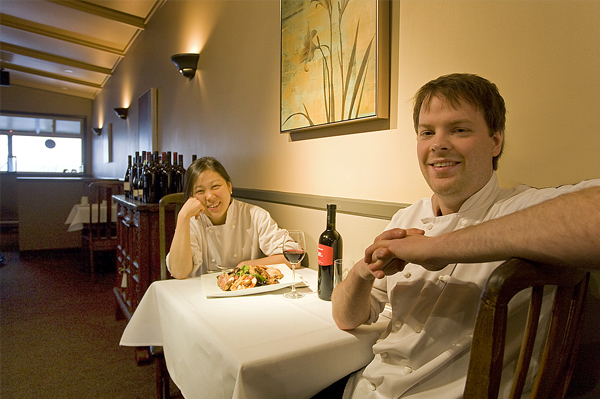 Emil Shellborn and Nah Yoon Kim create wholesome cuisine at Thyme on the Ocean in Comox. and it’s not one that’s reflected in current trends. Thyme on the Ocean, the cozy little restaurant on Comox Avenue that Shellborn opened with girlfriend and co-chef Nah Yoon Kim in 2007, is Shellborn’s way of subtly pushing back against an increasingly centralized food production system. Shellborn, who’s as talented as he is idealistic, embraces the “slow food” movement’s philosophies of buying fresh, local ingredients and building relationships with local producers. All of the meat and fish on his menu come from Vancouver Island, with the exception of occasional specials on Alberta steaks, and the restaurant serves only local vegetables during the summer months. Shellborn worries about the future of a society that has lost its connection with the earth and whose typical cuisine is more likely to come from a frozen foods aisle than from a personal garden. He describes stories he’s heard of people watching yellow or orange tomatoes go rotten while waiting for them to turn red, or children who visited a local farm to discover to their amazement that carrots come from the ground. “They were dumfounded that the carrots were dirty, because at Superstore they’re perfectly washed,” he recalls, dumbfounded. “I can’t believe that stuff—I don’t want to believe it. But it’s a common occurrence, and it’s happening. What Shellborn is really trying to do with Thyme on the Ocean is change the way we think about food. He wants our children to learn to prepare meals by hand using fresh ingredients, and to understand the importance of supporting local agriculture. Mainly, however, he wants to break our society’s addiction to processed foods and the typical unhealthy menu items that we have grown to accept as standard fare. Although he concedes that as a business owner he needs to tailor his menu to his market to a certain degree, he’s clearly not prepared to sacrifice his values to the extent of serving the sort of unwholesome meals that many people expect. “You’ll never come here and have alfredo sauce with grilled chicken,” he vows, alluding to the ubiquitous denizen of many a children’s menu. Shellborn imported many of his ideals from Italy, where he worked for three months in the kitchen of an upscale restaurant. He fondly describes Italy as being like many countries put together, with each region having its own distinct cuisine and its own local produce that lends its unique flavor to the region’s dishes. Although Shellborn openly promotes the Italian concept of localized cuisine, and he’s spent most of his professional career cooking in the kitchens of Italian restaurants, he says that Thyme on the Ocean was never intended to be an Italian restaurant. Shellborn’s driving desire to create a recognizable identity for Canadian cuisine is another by-product of his time cooking abroad, both in Italy and in France. French Canadians have done well, he says, with well-known dishes like poutine and sugar pie, but the rest of Canada is lagging behind. The mission of establishing a recognizable Canadian cuisine, however, begins to run into hurdles the moment you try to build a business out of it. Customers can’t identify with the concept of Canadian food, says Shellborn, and if customers can’t envision what sort of meal they’ll have in a restaurant then they’re likely to bypass it for more recognizable fare. Shellborn describes Thyme on the Ocean’s cuisine as “rustico,” meaning that it’s the same high quality that you’d find at a five-star restaurant but without the ornate garnishes, pretensions and high price that typically accompany such haute cuisine. Shellborn and Kim have strived to make their restaurant as friendly and approachable as possible, and to encourage dialogue and the fostering of relationships between them and their customers. The kitchen has been set up with a long, open window into the restaurant, so that Shellborn and Kim can greet and interact with customers while preparing their meals. One of them will often even deliver the plates to each table, lending a much more personal feel to the dining experience. While Thyme on the Ocean’s menu certainly features a distinct Italian theme, with a number of hand-made pastas, foccacia sandwiches (they bake all their own breads and pastries) at lunch and a selection of fresh, stone-baked Napolean pizzas during dinner hours, this Old World influence is offset by a host of local ingredients. Comox Valley greens and cheeses are found in a number of salads and appetizers; spaghetti dishes feature local bison or shellfish and locally produced pork adorns an olive rosemary foccacia sandwich on the lunch menu. The line between Old World and New is blurred in dishes like the scallopine, normally a traditional Italian dish served with veal cutlets but in this case served with strips of local pork, accompanied by black truffle mashed potatoes and finished with a wild mushroom sauce. Even the grilled albacore tuna, a veritable staple of any West Coast dinner menu, is served alongside crispy fried potatoes wrapped English fish ’n’ chips style in a folded newspaper. Well OK, it’s actually a photocopied newspaper, and one that contains a review of Thyme on the Ocean itself rather than the latest royal gossip from the Star, but if Thyme on the Ocean isn’t even supposed to be an Italian restaurant, it’s certainly not making any claims of British authenticity. Perhaps, consciously or not, Shellborn has hit the nail on the head with his desired concept of a Comox Valley restaurant. After all, our seaside community is bursting with people who have migrated here from elsewhere. A menu that had been created to appeal to such a diverse market may have indeed become one of the most accurate representations of our local citizenry. Even the drink list reflects the geographically antipodal theme, with beers from Victoria’s Phillips Brewing Company, a selection of BC wines and other local libations balanced with a newly introduced Italian drink list featuring wines, beers and unique cocktails from the boot-shaped country. Regardless of which influences are woven into Thyme on the Ocean’s menus, it’s easy to see where Shellborn’s passion lies. No conversation with him about food or drink strays very far from the theme of buying local and supporting the small, independent producers. “With our BC wines,” he says, “you generally can’t find them at the liquor store. We go to the small ones that aren’t listed, and they’re small enough, like we are, that they only make a few hundred cases instead of tens of thousands of cases. Shellborn’s nurturing attitude is perhaps in part a product of his own professional training, as he turned a raw but enthusiastic passion for cooking into a career as a chef. Shellborn got his first cooking job at a resort near his home town of Clear Lake, Manitoba when he was 16. After he graduated from high school, he worked for three months for no pay at Amici, one of Winnipeg’s finest restaurants, where he first learned the art of Italian cuisine. Eventually his volunteer service turned into a paid position, and over the next few years Shellborn improved his skills, completed some valuable work experience abroad and eventually became Amici’s head chef. About five years ago, Shellborn was recruited by Il Sogno, an upscale Italian restaurant in Calgary. Although his time in Calgary wasn’t a complete disappointment—it was there that he met Kim—he eventually grew tired of the pretension and materialistic lifestyle that surrounded him in the big city, and after two years he and Kim decided that it was time for a change. Shellborn and Kim considered several communities in BC and rural Quebec before eventually deciding on the Comox Valley because of its wealth of local produce. Although he can’t say for sure that this is where he and Kim will remain, and he even suggests the possibility of opening a restaurant in Kim’s native Korea, for the time being at least he will continue his work as a culinary crusader from his Comox Avenue stronghold. It’s a battle that Shellborn must feel he has at least a remote chance of winning, however, for he continues to lead his troops—his growing horde of repeat customers—into the face of his well-financed and deeply rooted corporate opposition. Battle lines have been drawn and positions have been staked. The battlefield, for the time being at least, is Thyme on the Ocean. Thyme on the Ocean is located at 1832 Comox Avenue and is open for lunch Tuesday to Friday and dinner Tuesday to Sunday. Phone 250-339-5570.